Here's a look at what I sketch with. Also known as a clutch pencil. I started using a leadholder around 2008, and I haven't touched a wooden pencil since then. I like its sturdy feel, which comes from the metal casing and the hard 2H lead. I also like the fact that the cap doubles as an emergency sharpener (although I rarely use it). The lead it comes with is harder than the more common HB and thus shows up lighter, but it also lasts longer and erases easier. 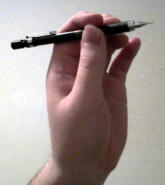 Also known as an automatic or propelling pencil. I mostly use this for fine details that I can't do with the leadholder. I wish I'd known about these things sooner. This erases leadholder marks exceedingly well, never erodes or leaves crumbs, doesn't damage the paper, and can be molded into any shape, from a sphere to a cube to George Washington's head (approximated). It doesn't erase mechanical pencil very well, though. Paper Mate Tuff Stuff eraser stick. 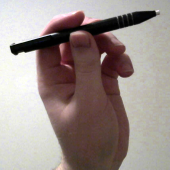 This is for anything that the kneaded eraser won't get, such as fine details and mechanical pencil marks. The soft vinyl is cleaner and less abrasive than rubber but is still best used with a light touch. I've had this binder since about 2000, and aside from a chipped zipper tab, it's held up well for its age. The paper I use is just plain white office paper. I really don't care about fine details such as tooth, weight, or brightness, because I'm just making cartoon line drawings. 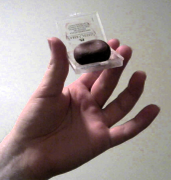 You can get a ream for about six or seven bucks at any office supply store, and you can either buy it pre-punched, or you can do what I did and buy a cheap three-hole puncher at Goodwill and spend an evening punching it yourself. I actually find it quite relaxing, but I'm weird like that. I never liked fancy art store sketchbooks. I found them expensive and awkward to work with, and the damned things would always fall apart before I got halfway through with them. 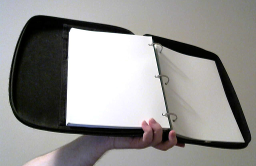 This is tidier and easier to carry, and I can remove pages easily for scanning and put them back when I'm finished. I can also experiment more freely because I don't have to deal with the neurotic fear of making "good" sketches that are "worthy" of a fancy skechbook. 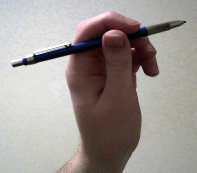 Of course, each artist has their own tools that suit their own style; this is just what I prefer. It really doesn't matter what approach you take to choosing your tools. What matters is that they feel natural to you so that you can make your best work and enjoy making it.